Jan. 28, 2016, 12:09 p.m.
Why Line? The app “supports both bots and conversational interfaces,” says deputy editor Tom Standage. By Laura Hazard Owen @laurahazardowen Jan. 28, 2016, 12:09 p.m. 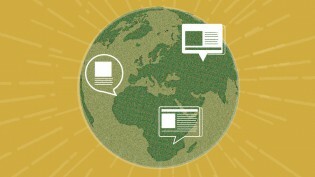 The Economist is publishing charts and other visual content on messaging app Line, the company announced this week. The Economist already promotes its bilingual English-Chinese app, The Economist Global Business Review, on WeChat in China, but it’s the first time the company is experimenting with a messaging app outside that country. “Clearly messaging apps are where social media is going next, and we and other publishers need to figure them out,” Tom Standage, deputy editor of The Economist, told me. Line had 215 million monthly active users as of the end of 2015, with 67 percent of those coming from Japan, Taiwan, Thailand, and Indonesia. (The Facebook-owned WhatsApp, meanwhile, has nearly a billion monthly active users.) But Line is unique among messaging apps in that it pulls in a lot of revenue from sales of stickers, books, games, and ads — it pulled in ¥120.7 billion (US$1.02 billion) in revenue in 2015. LINE NEWS, a news distribution service available in Japan, has successfully launched the “LINE Account Media Platform,” a new service which allows external media outlets to distribute news by creating an Official Account. LINE NEWS topped 22 million monthly active users in December 2015. LINE LIVE, a new live streaming platform that provides live video and programming free of charge, launched on December 10, 2015 and received more than 11 million unique viewers in its first month. Both of these services are exhibiting strong growth immediately after their respective launches. Meanwhile, the video-on-demand service LINE TV available in Taiwan and Thailand is steadily increasing users by offering more and more dramas and variety programs that suit the tastes of the respective regions. Other English-language news outlets — including The Wall Street Journal, BuzzFeed, the BBC, TechCrunch, and Mashable — are also on Line. POSTED Jan. 28, 2016, 12:09 p.m.
Owen, Laura Hazard. 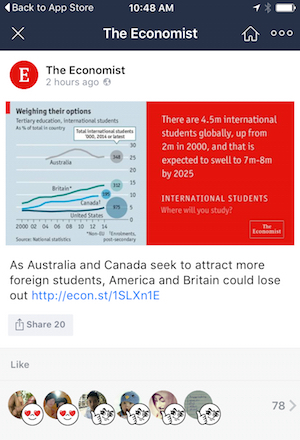 "The Economist starts publishing its charts on the messaging app Line." Nieman Journalism Lab. Nieman Foundation for Journalism at Harvard, 28 Jan. 2016. Web. 25 Apr. 2019. Owen, Laura Hazard. "The Economist starts publishing its charts on the messaging app Line." Nieman Journalism Lab. Last modified January 28, 2016. 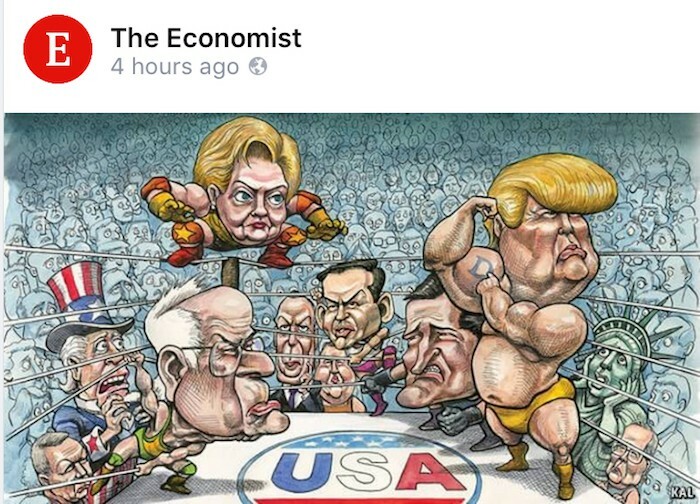 Accessed April 25, 2019. https://www.niemanlab.org/2016/01/the-economist-starts-publishing-its-charts-on-the-messaging-app-line/.